Okay, if you have a newborn like me, maybe difficult poems aren’t what you want to look at right now. So today’s rerun is for all those who are ready to get back into reading. For the rest of you who are in the same boat as me, I’m gaining a new appreciation for nursery rhymes. Oh and Milne’s poems are great. Last time we looked at a possible way to start reading poetry. I suggested maybe choosing poems that seem more accessible, but what about the ones that get labeled inaccessible? Today we’re going to think about difficult poems and why they’re important. So you’ve got a poem in front of you. You’ve been staring at it so long that your hand is starting to cramp from holding the page down. It starts off in a dead language, and then when you get some English, the syntax is so distorted that it might as well not be. Nouns are verbing and verbs are nouning and then words that you’re pretty sure aren’t English are treated like they are. And then! Then! Odysseus shows up or Aeneas or Orpheus and has the moxie to say something as though you’ve met him before and know all about his background. What are you supposed to do with THAT? Let go of the page, take a break and think about it this way: Difficult poems are an invitation. But to what? Here are a few different ways this pans out. We read everything so quickly now, from tweets to listicles to headlines. We’re all pretty adept at scanning text for information. But poetry isn’t about information. Difficult poems remind us of this when they slow us down. They can’t be reduced to information because the person who wrote them can’t and you as the reader can’t either. The underlying manoeuvre is one of rallentando. We are not meant to understand easily and quickly. Immediate purchase is denied us. The text yields its force and singularity of being only gradually. In certain fascinating cases, our understanding, however strenuously won, is to remain provisional. There is to be an undecidability at the heart, at what Coleridge called the inner penetralium of the poem. So next time you’re puzzled by a poem that may mean you’re on the right track. Some poems can’t be understood on the first reading, let alone completely mined. In my view, difficult poetry is the most democratic, because you are doing your audience the honour of supposing that they are intelligent human beings. So much of the populist poetry of today treats people as if they were fools. And that particular aspect, and the aspect of the forgetting of a tradition, go together. So when Odysseus or Aeneas show up, it’s actually a good sign that the poet respects you. 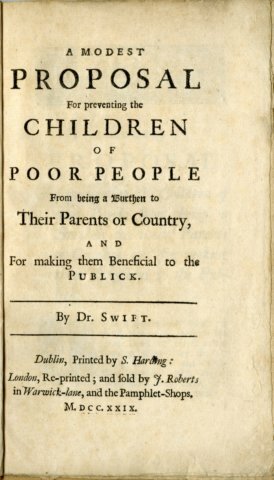 Or in the world of prose, as crazy as it sounds, when Jonathan Swift in “A Modest Proposal” tries to convince you to cook and eat Irish babies, that’s actually a wonderful sign that he respects you so much to trust that you would never do such a thing. Allusions and irony and satire and all the things authors do to add layers to their writing increase intimacy with the reader through mutual respect. This blog post needs just one reading. Maybe it just needs to be skimmed. A novel can be read once a year every year for life (LOTR for instance) but you can still say you’ve read it if only once as a teenager. But if you’ve read a poem only once then you haven’t really read it. Poems require multiple readings because the language is so dense, each word is doing so much. Novels and short stories, especially the good ones, can share in this same experience, but it’s a principal feature of poetry. That’s the mystery of literature. Each re-reading brings out something new. Just maybe then, when you come across a difficult poem, that’s an invitation to come back to it again and again as little things about it start flaring up in front of you. It’s like looking at the night sky. Just glance at it and go back into to the lamplit room and maybe you’ll have the impression that the sky is overcast. But stay out there and wait for your eyes to adjust and just maybe you’ll see a few more stars and the faint sliver of the moon. Thank you so much for this wonderful blog entry. I once (from memory but it was fairly reliable) wrote out my various understandings of Stevens’s “The Emperor of Ice Cream” from ages 15-55 assuming a reading every 5 years. It’s amazing how much I enjoyed and so little understood my first reading. But I trusted that I would know more and do better the next time. And so it was and so it continues to be. And I am lucky to have many relationships with poets and poems. It’s been the best investment of my reading time throughout my life.